Beer has been brewed in England since Neolithic times, and this book combines a thoroughly enjoyable exploration of beer’s history and built heritage with new in-depth research into the nuts and bolts of its production. Based around England’s breweries, but occasionally ranging further afield, it tells the intriguing story of the growth of this significant industry. From Georgian brewing magnates who became household names – and their brewhouses notable tourist attractions – through magnificently ornate Victorian towers to the contemporary resurgence of microbreweries, the text throws new light on brewers and the distinctive architecture of their buildings. Detailed chapters explain what makes a brewery work, revealing the functions of sometimes enormous brewing vessels, the astonishing skills of coppersmiths and engineers, the work of heroic mill horses and the innovative steam engines which replaced them. The wider context of the brewing industry is also investigated, bringing out the breadth of the ‘beerscape’, including those buildings put up with brewing profits such as the original Shakespeare Memorial Theatre in Stratford-upon-Avon. A brewery index allows readers to find which sites are extant and can still be visited. Traditional working breweries are to be treasured and celebrated, but complementing these, the book looks to the future, considering constructive redevelopment as part of our national brewing heritage. This fascinating and lavishly illustrated work shows how deeply interwoven beer and brewing are within English culture. If you care about beer, industry or England, this book is for you. This is not just a technical reference book; it is a highly readable account of how over history our beer has been provided and the people and buildings that have played their part. I recommend it without reservation. An immaculately produced history of English beer production, its brewers, architecture, technology. geography and brewery landscape. Illustrations on every page, references, bibliography, sites index, as well as a reflection on the re-use possibilities for these complex and specialized sites. Few industries enjoy as much public affection as brewing, and with small-scale operations enjoying a renaissance across the United Kingdom, Lynn Pearson provides a timely review of its ups and downs. ... Like all English Heritage books, much of the value of 'Built to Brew' lies in its many illustrations. 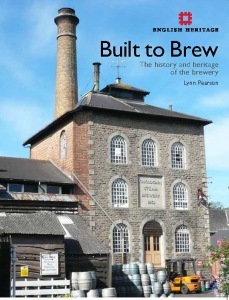 Lynn Pearson has produced a rather fine book covering both the history and heritage of brewing in the UK. This is a facinating insight, which links up neatly with economic history, ... and begins to give us a stronger basis for understanding the growth of the brewing industry. ...every page is worth reading for the often fascinating insights that Lynn Pearson's research has revealed. The book itself is a visual delight. This is an impressive, well researched book with a wealth of detailed information and a huge number of illustrations. ... Lynn Pearson's writing and English Heritage's presentation have come together to create a visually stunning and enjoyable read. Outstanding. Built to Brew is perhaps written as a record rather than as literature, but it is indispensable on that level and is very generously illustrated with contemporary and historic photographs and drawings. Whether the readers' interest is in production or comsumption, Built to Brew offers a comprehensive guide to the processes of brewing, the engineering and architecture of breweries, and the wider effects of brewing on the historic built environment. Built to Brew provides a wealth of detail on the history and development of the brewing industry and its associated structures. It will form the basis for many different in-depth studies.